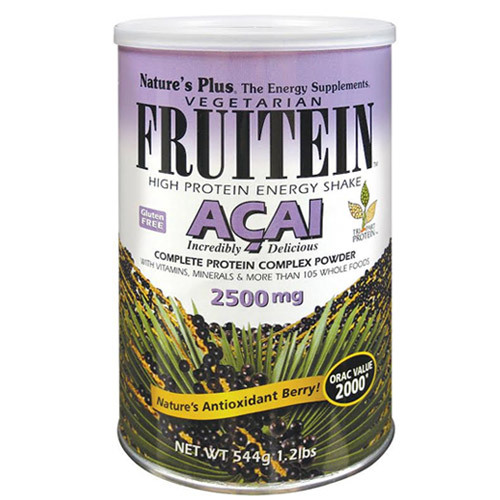 Featuring 2500 mg of whole berry acai berry concentrate, rich and creamy Nature`s Plus Fruitein Acai Shake is an incredibly delicious, all-natural vegetarian blend of complete protein and complex carbohydrate. Acai berry is clearly the world`s most popular superfruit for anti-ageing, energising, cardiovascular, digestive, metabolic and weight loss support. With an outstanding ORAC value of 2000, every smooth and sumptuous serving of Natures Plus - Fruitein Acai Shake supplies this comprehensive acai activity along with vitamins, minerals, complete vegetarian protein, and more than 115 whole foods. Proprietary non-GMO protein blend (rice protein, pea protein and soya [isolated soya protein and fermented soya]), fructose, açai berry whole fruit concentrate (2500mg), maltodextrin, tri-calcium phosphate, potassium citrate, magnesium oxide, thickener (guar gum), oat bran, bulking agent (microcrystalline cellulose), spirulina, vitamin C, Proprietary Whole Food Blend [spirulina, cooked whole brown rice, fructooligosaccharides (FOS), chlorella (broken cell), Pacific kelp, Phenalgin™ (Cystoseira canariensis), cryptomonadales, red kelp, brown kelp, ulva, red seaweed, dulse, rockweed, Spanish bee pollen, sunflower oil, black currant seed oil, apple, apricot, banana, cranberry, orange, peach, red raspberry, strawberry, tomato, alfalfa sprout, beet greens, cabbage, onion, parsley, papaya, red grape, broccoli, carrot, garlic, spinach, Chinese green tea (decaffeinated), red wine, Korean ginseng, thyme, rice bran, white nectarine, white peach, white fig, date, banana, potato, white pear, white tea, jicama, jerusalem artichoke, shiitake mushroom, parsnip, turnip, cauliflower, ginger, kohlrabi, shallot, mango, grapefruit, yellow apple, pear, honeydew melon, pineapple, yellow squash, gooseberry, golden kiwi, nectarine, yellow watermelon, pumpkin, butternut squash, yellow fig, cantaloupe, yellow beet, rutabaga, tangerine, lemon, yellow pepper, lowbush blueberry, blackberry, elderberry, lingonberry, plum, black cherry, purple fig, Belgian endive, passion fruit, purple kale, rhubarb, Concord grape, beet, radicchio, eggplant, pomegranate, purple onion, black currant, noni, mangosteen, açai, black raspberry, bilberry, highbush blueberry, fenugreek, guava, watermelon], d-alpha tocopheryl acetate, choline bitartrate (50 mg), inositol (50 mg), apple pectin, Spanish bee pollen, niacinamide, vitamin A palmitate, zinc oxide, manganese sulphate, ferrous fumarate, calcium pantothenate, rice bran, black currant seed, Korean ginseng, acerola cherry, enzyme-rich papaya concentrate (30 mg), enzyme-rich pineapple concentrate (30 mg), apple pectin, pineapple, carrot, kelp, lecithin, lemon peel (25 mg) (supplying naturally occurring bioflavonoids), papaya, chlorophyll, pyridoxine hydrochloride, riboflavin, thiamin hydrochloride, cyanocobalamin, ergocalciferol, folic acid, biotin, potassium iodide, chromium chloride, sodium selenite, sodium molybdate. Add one scoop - 36g (scoop included in can) of Fruitein Acai to 170ml of water and mix in blender or shake until smooth. For those who prefer a thicker, richer shake, Fruitein Acai may also be mixed with 227ml of milk. For best results, water or milk should be very cold. This product is sold by weight, not volume, therefore settling of contents may occur during the shipping and handling of products. Below are reviews of Nature`s Plus Fruitein Acai Shake - 544g by bodykind customers. If you have tried this product we'd love to hear what you think so please leave a review.